Configuration can be any key value pair information needed by the application at runtime. Spring applications accepts configuration in many ways like command line arguments, OS environment variables or application properties and so on. In the context of microservices we can have multiple applications running together and if each application maintains its own set of configuration then a simple change in the configuration needs deployment or restart. If we have to change configuration in multiple applications then this approach is a time consuming and not efficient. Alternative way is to have a config server application. The main purpose of this application is to manage configuration for all applications. All other applications on the startup will request configuration from the config server. Applications which request configuration are called config clients. Config server and config clients, both are the spring based applications. With the config server and clients in the place now the config changes we make on the server will reflect on the client application with out deployment or restart. In the microservices environment this is a very useful setup because configuration for all applications are maintained at single location and the changes are reflected on the client applications with out restart or deployment. 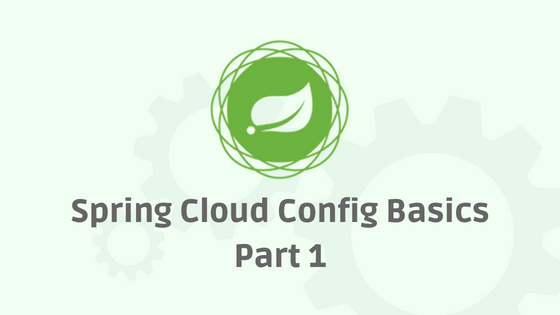 Config server is just another spring application which runs on its own port and manages config repository. Config repository is a location in which we can store application properties. Config server can support many types of repositories like git, local file system, database or vault back-end. By-default config server uses git folder as the repository. In this repository folder, create a configuration file for pet-store application. In the next part of this article we will create a pet-store application which uses config server to get configuration from this repository. To create a pet-store configuration for a dev profile we need to name file as pet-store-dev.properties. We can have multiple configurations for same application but different profiles. Lets just have a single property in it. Now our local git repository contains single configuration file. Lets create a config server. Unzip and open project in any IDE. Below image shows the link between server, repository and client applications. In this post we created git repository with single configuration file and a config server. In the next part we will create a pet-store application which will request properties from the config server.